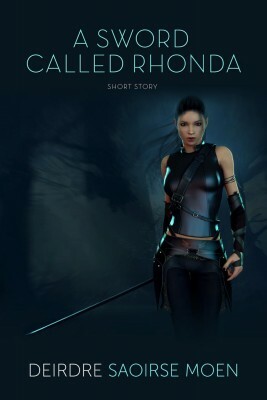 “A Sword Called Rhonda” is a 2800-word fantasy short story, originally published by Baen in the Esther M. Friesner anthology Turn the Other Chick. She hung from the wall of my small home in what used to be suburban Palo Alto. Being far away didn’t help. I could hear her just as clearly as if I’d held her in my hand with her voice coming out the end of the hilt. I’d tried hanging her from my waist at first, but she just yelled loud enough for everyone to hear. Now, I carry her over my shoulder so she talks in my ear. “Yeah, yeah, I hear you,” I replied. Two weeks ago, I bought the sword at the city’s disincorporation sale. It was a fine sword, made of good strong steel that could take a beating. At the time, it seemed like a good deal. One morning, I started singing the old Beach Boys tune. “I thought no one would ever listen to me!” Rhonda said. She hasn’t left me alone since. For the near future, this is an Amazon exclusive. It’s also available to borrow for free if you’re a Kindle Unlimited member. If you’re not, there’s a free 30-day trial; you can borrow up to ten books at a time.